When it comes to swimming pools, the style options are unlimited. By combining materials in unique combinations you can have a look that is all your own. 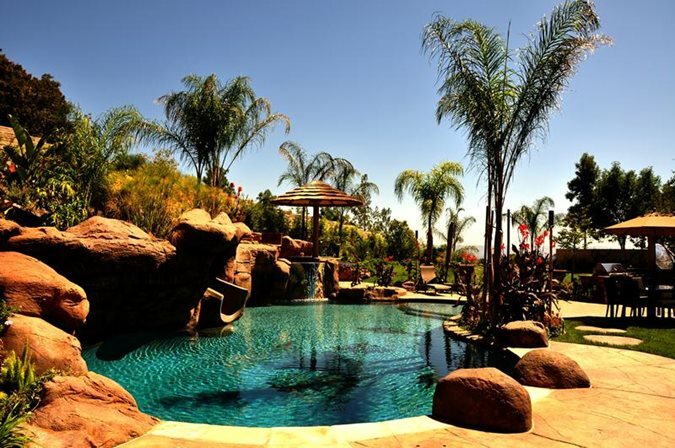 A good starting point for selecting a pool style is to look at the style of your home. 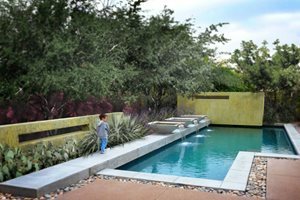 Designing your new pool in a similar fashion will make it look as if it was there all along. 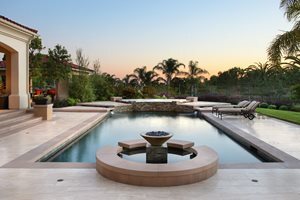 Modern pools are characterized by clean lines and geometric shapes. They often feature vivid colors and eye-catching displays of mosaic tile. In order to keep the simplicity of shape, spas are often inset in modern pools. Coping is either non-existent or very refined, poured concrete is popular. 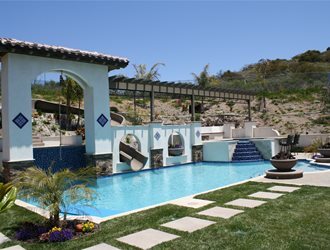 Mediterranean pools are best known for their aqua water color and Greek or Roman shapes. 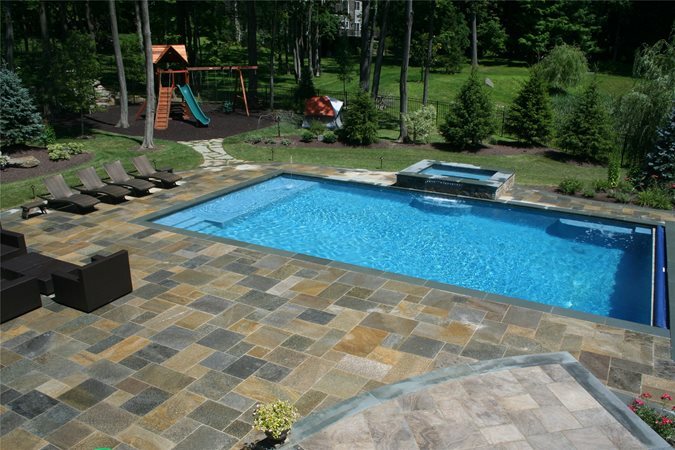 Stone decking is a popular choice, with colorful ceramic tiles accenting the waterline. Waterfalls are popular features to include in a Mediterranean swimming pool. See more Mediterranean swimming pools. Traditional pools are the most common. 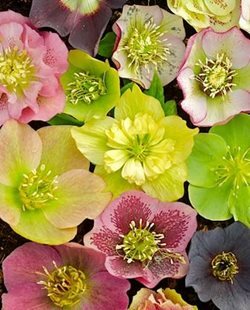 They usually have a classic shape such as rectangular or kidney. The coping on a Traditional swimming pool is distinct, with brick or paving stones outlining the perimeter visually. Timeless paving materials are using for decking, think brick, pavers or natural stone. 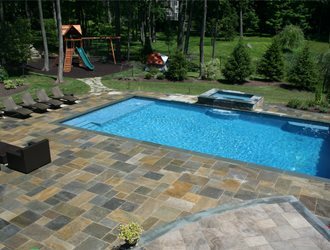 Many traditional pools feature a raised spa that spills over into the pool. 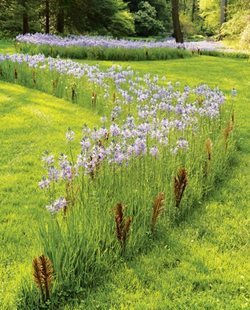 Typically, the water color is that of a natural lake or pond. 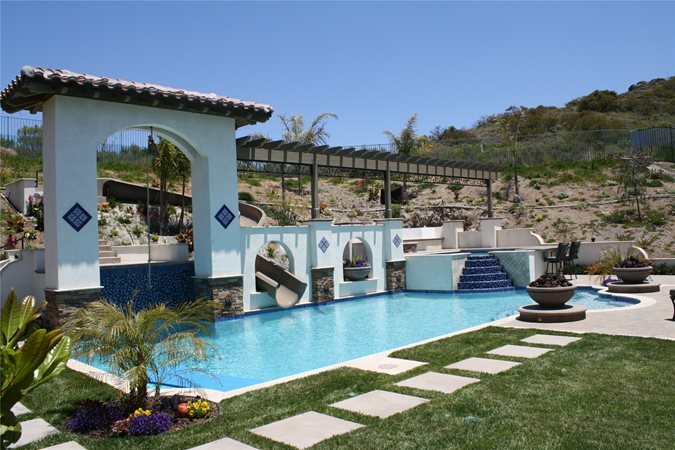 See more traditional swimming pools. When you think of the tropics, water and relaxation automatically come to mind. 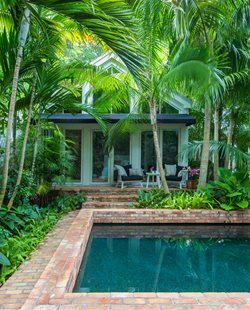 A tropical pool can bring a bit of the vacation atmosphere to your backyard. 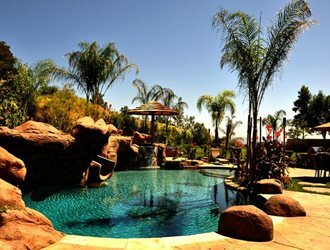 Waterfalls, lush plants, boulders and palm trees are all hallmarks of tropical-style swimming pools. To take your tropical pool over the top, try adding planters right up against the coping, or inlaying a mosaic of fish, turtles or another tropical motif on the bottom of the pool. See more tropical swimming pools.